You’ve had it with your old, worn-out mattress that has surely seen better days. Whether it’s begun to sag in the middle or just makes a good night’s sleep utterly impossible, it’s time to do some hunting for a new sleep set up. Recurring back pain, chronic fatigue and sore shoulder joints upon wakening are some tell-tale signs that you’re in need of a new mattress. But how do you pick the right one amid the sea of tempting choices? Latex and memory foam have distinct advantages, but so do the newer hybrid beds that boast new comfort technology backed with the durable support of innerspring coils. Sleep experts will tell you that one particular brand isn’t superior to another. It all comes down to your own preferences for firmness, support and temperature levels. When shopping for a new mattress, heed these tips on how to try before you buy. Testing out a mattress is crucial to picking the right model for you and your sleep partner. Most showrooms feature varying product lines designed to cater to all tastes and health concerns. So if you’re in the market for an Ultra Plush pillow top or have been hankering for the deep down support of a firm bed, you’ll have plenty of options from which to choose. Know before you go — There are no hard and fast rules when it comes to buying a new bed. Firm mattresses aren’t always the solution for a bad back, and cushy pillow toppers don’t always mean cloud-like buoyancy. Throw out any preconceived notions about what constitutes a firm or soft bed or what materials tend to sleep hot, and open your mind to trying something new and different. Researching various product lines before visiting your nearest mattress outlet can be helpful, but remember that your body will tell you which bed you like best. Talk to your physician about health concerns first – If you have a history of sleep apnea, poor circulation or lower back issues, speak with your doctor or physical therapist about their recommendations first. While they may not be sleep experts, they might suggest body-conforming materials that can help alleviate symptoms. Test mattresses just like you would at home – Ensure you’re wearing comfortable clothes (slip on shoes are also helpful) when testing out your potential new bed. If you’ve got a partner, bring them along so you can both crawl in and out of bed just the same way you would at home. Pay special attention to motion transfer and distribution with two people moving on the bed. If your mate tends to flop around a lot at night, have them replicate these movements as well to find a model that has the least amount of disturbance. Try out your usual sleep position – It’s important that the mattress feels comfortable and supportive when in your usual sleep position, whether your side, stomach or back. Test this out in the center, outer edge and third quarter of the bed, and make notes about which models feel right for you. Once you’ve narrowed down your options, you can test drive your favorite three mattresses once again to make a final decision. Importance of spinal alignment – The right mattress is the basic building block to a good night’s sleep. But even a $5,000 model combined with the wrong pillow can wreak havoc on your neck and spine. After you’ve picked out your mattress, make sure your pillow is complementary and promotes correct alignment and good neck support. 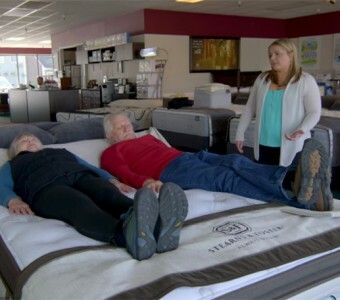 Here at Mattress World Northwest, our staff is well-versed in the latest sleep technology offered by leading brands like Sealy, Simmons, Englander and Stearns & Foster. We’re proud to offer huge savings on some of the best orthopedic mattresses on the market. Start your journey to better health with a custom sleep analysis that can help guide you on the right path.